Caring for your golf shoes includes polishing them regularly. Although it might seem like common sense to take meticulous care of your golf clubs during and following each round of play, it's easy to remove your golf shoes, throw them in your trunk and forget about them until you need them again. This neglect will not prolong the life of the shoes. Golf shoes can be a significant financial investment, and when you take proper care of them, they should last you for several years. 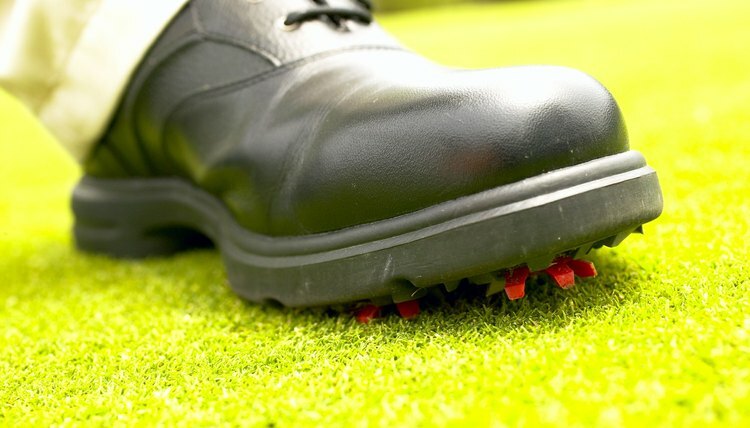 Scrub the outsoles of the shoes with the brush part of a golf cleaning tool to remove dirt, grass and other debris. If the debris is caked on, pry it loose with the sharp point on the cleaning tool or use a golf tee. Add water to the outsoles during this process if the dirt is too hard to remove with ease. Wash your shoes with a rag and warm, soapy water following the completion of each round. Doing so will remove dirt, grass and even pesticides from the shoes. Dry the shoes thoroughly with a microfiber towel. Polish the shoes occasionally to restore their shine. Choose a polish in the same color as the shoes, whether the shoes are white, black or brown. Following the instructions on the polish, rub it into the shoe leather and buff it with a brush or clean rag. Check the cleats for wear after every few rounds. It's common for some of the cleats, especially plastic spikes, to wear down. Typically, a set of soft cleats should last between 10 and 15 rounds, depending on how often you walk on hard surfaces such as parking lots and cart paths. Unscrew them with a cleat wrench and replace them with new cleats.